Situated in the lush landscape of Ecuador’s Andes mountains, one of the top priorities of our Cuenca office is to protect the high-altitude ecosystems that supply water to millions of people living downstream. We recently celebrated the declaration of the 23,094 acre El Pan Municipal Reserve after a year of close work with El Pan’s Municipal Government, Ecuador’s Electric Corporation, and local communities. Armed with the knowledge that their way of life is made possible by the páramos and cloud forests of the Andes, these stakeholders partnered to protect these fragile ecosystems and the water they provide to local people. El Pan, located northeast of the province of Azuay, sits on approximately 32,000 acres of land and is home to a little over 3,000 people. 51% of El Pan’s landscape is fully intact, species-rich montane forests and lush páramos – high-altitude grasslands that play a key role in the water cycle. 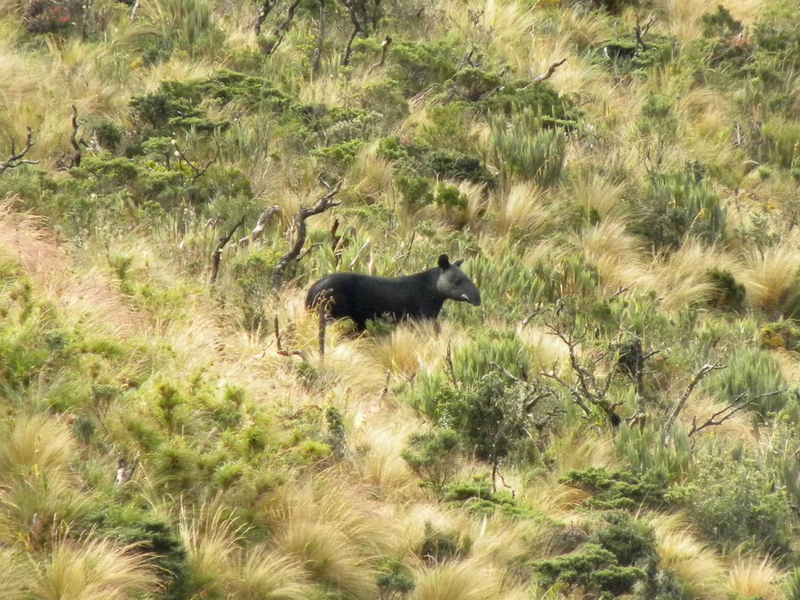 These ecosystems are vital habitat for endangered species such as the mountain tapir (Tapirus pinchaque) and the spectacled bear (Tremarctos ornatus). Our local conservationists worked with community members and completed the extensive technical documents needed to declare the reserve, including geo-mapping and biological studies. On January 21, 2016 the Municipal Government of El Pan officially declared 23,094 acres as municipal reserve. Moreover, NCI played a key role in integrating the new municipal reserve into the FONAPA Regional Water Fund. FONAPA is an innovative mechanism for funding conservation, and has had overwhelmingly positive results since its revitalization by NCI in 2011. After enrolling in the program, municipalities collect a small fee from water users, which is then used to fund conservation activities ranging from reforestation and environmental education to land purchase and watershed management. Some municipalities have seen as much as an 80% decrease in waterborne disease, and a 30% decrease in water treatment costs after enrolling in FONAPA. Communities have also seen their water supply increase dramatically, from just two to four hours of water a day to over 12 hours. This declaration is one of many that are part of NCI’s ambitious plan to protect Ecuador’s Andean corridor – a biodiversity hotspot that plays an integral role in sustaining the water cycle and mitigating climate change. With 370,000 acres protected in the Andean corridor to date, NCI’s goal is to protect another 200,000 acres in 2016 by expanding its work with municipalities to declare reserves. Our work is being made possible by the funding of the Moxie Foundation and Bobolink Foundation, as well as generous individual donors. You can read more about our Andean Corridor program, and meet the director of our office in Cuenca.